Industrial Hose, Couplings, Accessories - Kuriyama of America, Inc.
Kuriyama’s New & Improved Single Jacket Mill Discharge Hoses now have a thicker cover design which provides more abrasion resistance along with longer hose life. The hose is made using a smooth natural rubber tube which provides strength and flexibility. The cover is made with 100% polyester yarn and is water and mildew-resistant, which prevents rotting, even if the hose is stored wet. 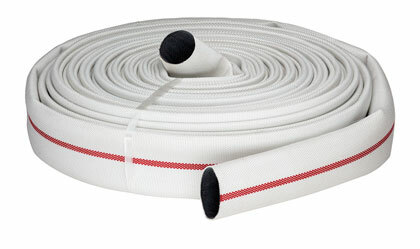 Hoses are individually packaged in cartons for ease of handling and shipping. Click here for more info.